After the relative excesses of the last two banana breads (so much butter! so much sugar! ), I needed something a little healthier, something a little less… refined. This 100% whole wheat bread seemed to fit the bill perfectly, despite the stick of butter in the original recipe. In an attempt to make the bread a little lighter, I substituted half of the whole wheat flour for white whole wheat flour, a finer grind that acts more like all-purpose flour. But to preserve a little of its hearty nature, I added in some wheat germ and my personal favorite, ground flaxseed. To compensate for the extra dry ingredients and slightly-reduced fat level, I intended to add 3 or 4 tablespoons of plain yogurt. Note the use of the word “intended”. Yes, I totally forgot to add the yogurt. The bread turned out just a smidge on the dry side, but it wasn’t unpleasant. Had I remembered, I think it would’ve been better, though. I’ve written that addition into the recipe, so you won’t experience the same less-than-ideally-moist fate as I. 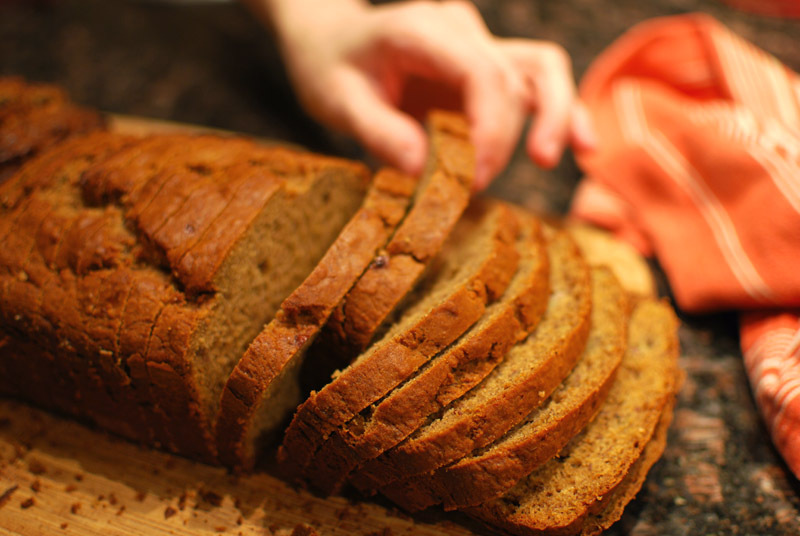 Otherwise, this bread had a nicely-balanced flavor, not too banana-y, not too whole-grainy; it had a soft crust and was tender inside; it cut easily into pretty slices. It was nice enough, but it was simply not the best variation of the week. If I don’t sound very excited about this bread, it’s no fault of its own; can you really blame me after the heady, butter-fueled rush of the last two days? This bread tasted pretty good, and would probably be quite delicious if tested on its own, not compared to such shining stars as I’ve made this week. But all the same, I think I’ll stick to my tried and true low-fat banana bread instead. I’ve made that one my own over the years, and anything else would have to really impress me to take its place! 1. Preheat the oven to 325° F. Lightly butter a 9 x 5 inch loaf pan, sprinkle with flour, and turn upside down and knock on the bottom to remove excess. In a medium bowl, whisk the flours, wheat germ, and flaxseed together; set aside. 2. Using an electric mixer, beat the butter and sugar together until smooth. Add the baking soda, salt, cinnamon, and nutmeg; mix until incorporated. Add the smashed bananas, honey, eggs, and vanilla, beating until smooth. Add the flour mixture, stirring just until all flour is moistened. Do not overmix. Transfer the batter to the prepared pan, and let it rest at room temperature, uncovered, for 10 minutes. 3. Bake at 350° F for 50 minutes; then tent gently with a piece of foil. Continue baking until a skewer inserted into the center comes out clean, about 10 to 15 minutes more. Remove the bread from the oven and allow it to cool in the pan briefly before turning it out onto a rack to cool completely. Serve warm.